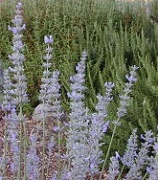 Medium to light purple flowers on long wands make Hidcote Giant very different from the very small, true English variety called simply Hidcote Lavender. Hidcote Giant Lavender is a tall hybrid that is a much better choice for hot summer areas. Hidcote Giant Lavender is one of six plants chosen for our Crafter's Herb Garden Six Pack Zones 8-11. It would also make a great addition to our Zone 5-11 Fragrant Herb Garden Six Pack. This plant is often available in plug trays. These trays hold 128 of all the same plant. They are a great low cost way to fill a lot of space. Each cell is 3/4 of inch by an inch. Check here to see if Hidcote Giant Lavender Plug Trays are available.